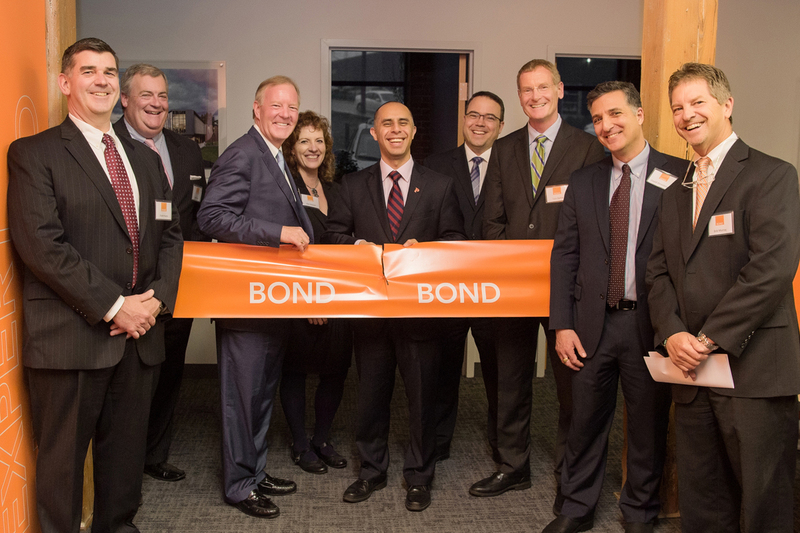 (Boston, MA) – BOND, the Northeast’s premier full-service construction management and general contracting company, announces its expansion to the state of Rhode Island with the opening of a new Providence location. The company celebrated with a Ribbon Cutting Ceremony and Open House attended by Providence Mayor Jorge O. Elorza, along with BOND clients, business partners, colleagues and employees. The new office is located at One Cedar Street, Suite 100, Providence, RI, 02903. Leading the office is Dan Ramos, Regional Manager. In his new role, Ramos is responsible for expanding BOND’s geographical presence throughout Rhode Island, Southeastern Massachusetts and Eastern Connecticut. He works with a new office leadership team including James “Bo” Koloski, Director of Client Services and Kim Silvestri, Project Executive. Koloski leads the business development effort for Rhode Island, while Silvestri is focused on leading BOND’s healthcare projects. Over the years BOND has completed several Rhode Island projects such as Roger Williams University’s North Campus Residence Hall, Brown University’s Campus-Wide Utility Initiative and Bryant University’s Salmanson Dining Hall. Current work in progress includes Bryant University’s Academic Innovation Center, Bristol Community College’s New Technology and Learning Center and UMass Dartmouth’s School for Marine and Science Technology. BOND’s Providence office will focus on the academic and healthcare sectors initially, with plans to offer services and capabilities across all of BOND’s market sectors. For more information on BOND’s Rhode Island service offerings, please contact James Koloski, Director of Client Services, BOND at jkoloski@bondbrothers.com or 401.383.7007.